GIA colored stone reports describe the type of gemstone, if your stone is natural or synthetic, and if there are any detectable treatments. When determinable, origin will be provided for certain stones. Included in all reports is the gemstone cutting style, shape, weight, measurement, color and a photograph of the stone. 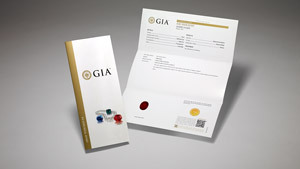 Multiple security features on GIA colored stone reports ensure their authenticity. Loose or mounted gemstones may be submitted for these services. The GIA Identification Report describes whether the stone is natural or synthetic, identifies the type of gemstone, and includes any detectable treatments. This report also contains a detailed description of the gemstone such as cutting style, shape, weight, measurement, and color, and includes a photograph of the gemstone. For large items, contact your Client Service Representative. Items over 50 kg are not accepted. The GIA Identification & Origin Report describes whether the stone is natural or synthetic, identifies the type of gemstone along with an opinion on the geographic origin of the stone if determinable, and includes any detectable treatments. This report also contains a detailed description of the gemstone such as cutting style, shape, weight, measurement, and color, and includes a photograph of the gemstone. If an opinion on geographic origin cannot be given, the report will be issued with the geographic origin result as “inconclusive” and the Identification Report fee is charged based on the weight of the stone. For large items, contact your Client Service Representative. GIA Add-On Services give you further information or security for your gemstone. Must accompany a Report Service or Follow-Up Service. Certain services can be expedited for an additional fee; exceptions will apply. Expedite the service time of the Identification Report service for loose or mounted gemstones. Turnaround time is 48 hours (excluding weekends and holidays). Express Service for Identification and Origin services can be expedited to 72 hours. By appointment only. Not available for Quality Assurance, Colored Stone Sorting or On-Site Consultancy Services. Certain services or large submissions may require a longer turnaround service time, contact your Client Services Representative for details. Personalize, brand or easily identify your gemstone. Microscopically inscribe a personal message, symbol, logo, or your gemstone’s unique GIA report number on its girdle. Not available with Report Verification service. The Damage Assessment service is offered as a supplement to GIA identification reports to determine if a gemstone has been damaged since its last polishing. Results of the damage assessment are delivered in letter format. Verify, re-evaluate or update results from your original GIA Report through GIA Follow-Up Services. Request a re-assessment of the color, treatment, identification, geographic origin, weight, shape, cutting style or measurements (dimensions) of your gemstone. Service must be requested within 60 days of original report date. If requested after 60 days, an Update service must be performed prior to the Recheck or Final Observation. To confirm your gemstone’s identification results or if the gemstone has been recut, resubmit the gemstone along with its original GIA report. The gemstone will go through the identification process and a new report will be issued. The old report will not be returned. Update service can accompany Add-On services where a re-evaluation of the gemstone is required prior to performing the Add-On service. Convert your Identification Report into an Identification & Origin Report or vice versa. 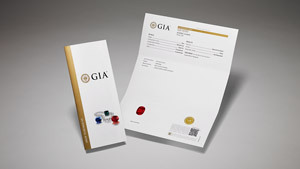 To convert from Identification to Identification & Origin Report, gemstone and original GIA report must be submitted. For conversion from Identification & Origin to Identification Report, only the original GIA report must be submitted. Confirm that your GIA report matches your gemstone. Verification results will be returned in letter format attached to your original report. Inscription not available with Report Verification service. GIA Specialty Services offer further analysis and information on your noteworthy gemstone. Services are customized with in-depth information specific to your gemstone. Various levels of service are available depending on your needs. The GIA Monograph is a customized gemological report designed to showcase and celebrate exceptional gemstones. Each monograph comes complete with photographs, detailed identification information, spectroscopic analysis, historical background and other supporting content. The monograph tells the complete story of the gemstone and is presented within a handmade box inscribed with the gemstone’s name. 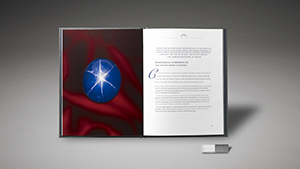 Included is a USB drive with the digital copy of the gemstone’s story. Please call your Client Services Representative for details or contact us. Packaged in a hard-bound portfolio, the GIA Portrait Report sets out all the data that supports the conclusions reached in an Identification or Identification & Origin Report. 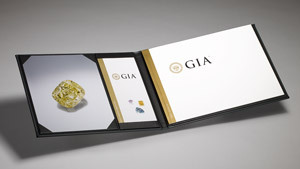 The Notable Letter accompanies a GIA report and details the attributes of especially noteworthy or unique gemstones. The letter includes a face-up photo and comments on the gemological properties such as color, size, and clarity that make the gemstone unique. GIA Batch Services utilize GIA-developed technology to analyze and sort gems based on varying test types. Minimum submission quantities vary by service. Evaluates gemstones and sorts them based on pre-specified test categories. Gemstones that pass receive an Identification or Identification and Origin Report depending on the client’s request and are charged accordingly. Gemstones that do not pass the test criteria are returned without a report and charged a nominal fee. Available tests will vary depending on stone type. *Testing for beryllium and heat treatment will be performed if required and charged accordingly. Available tests will vary depending on gemstone type. Identifies and provides results based on specified test criteria for gemstones. Results are presented in a table format. No identification information is included on the report. Not available for gemstones that have already received an Identification or Identification & Origin Report. Free online tool to estimate a cut grade, simply by entering the proportion and finish information.